The good news is Illinois drivers pay less than most other drivers around the nation. The average cost for car insurance nationwide is $1,311. In Illinois, it's only $1,079. You'll get the best rates if you compare quotes from multiple companies before you choose a policy. 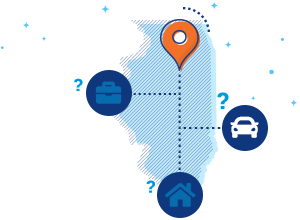 What does Illinois car insurance actually do for me? Illinois drivers are required to have car insurance, and most states have similar laws in place. This is meant to ensure that drivers are prepared if they cause an accident and have a way to pay for the resultant damage and medical bills. Who pays if the accident wasn't my fault? The driver who caused the accident is responsible for covering the cost of damages. Even though drivers are supposed to have insurance, some Illinois drivers get behind the wheel without coverage. This can lead to major problems if they cause an accident. Uninsured motorist coverage gives you an added layer of protection, stepping in to pay for damage and medical bills if you are hit by a driver who isn't insured and cannot afford to cover the cost of your damages. Which are the best insurance companies in Illinois? An independent insurance agent compares multiple companies to find the best policy for your needs. Now, let's take a quick peak at what’s going on in your city. Insurance companies look at a lot of factors when determining car insurance costs. One of many factors is location. Crime rates and time spent in the car will factor into how much your car insurance will cost. The average monthly cost for auto insurance in Peoria is $79. Your insurance rates could be considerably higher or lower, depending on such factors as your age, vehicle, and driving history. Long commutes are not only annoying; they also drive up costs for insurance. Luckily, Peoria drivers spend less time on the road than most of this nation’s workers, and this results in lower average rates for car insurance. Drivers in high crime areas face an elevated risk for auto theft and vandalism. In Peoria, auto theft rates are well below the national average. This could help decrease your monthly insurance cost for adding comprehensive (or “other than collision”) coverage to your auto insurance policy. The average monthly cost of car insurance in Champaign is just $45. Bear in mind, however, that rates vary from one driver to the next, and your monthly cost could be significantly higher or lower than this average. It all depends on your age and driving history, the kind of car you drive, and a number of other factors. If you log a lot of miles on the busy roads of Illinois, you'll likely see a spike in your insurance rates. Champaign drivers typically spend less time on the road than most people in this state, and this helps keep local car insurance rates down. You're more likely to have your car stolen or vandalized if you live in a dangerous area. Fortunately, Champaign has a very low auto theft rate, so you can rest easy knowing you may see significant savings on adding comprehensive coverage to your auto insurance policy. The average monthly cost of auto insurance in Bloomington is $71. Of course, your actual rates may be significantly higher or lower than average depending on a variety of factors including your age, the kind of car you drive, and your driving record. The more time you spend driving, the more likely you are to get into an accident. In Bloomington, commute times are typically much shorter than the national average, which could reduce your auto insurance rates. Additionally, auto theft is a serious issue in some parts of Illinois. Fortunately, Bloomington has a very low auto theft rate, and this helps keep costs for comprehensive coverage lower for this city’s residents. The average monthly cost of auto insurance coverage in Decatur is $80. Depending on the kind of car you drive, your age, your driving history, and several other factors, your personal monthly cost for coverage might be significantly higher or lower than the average. Simply put, when you spend more time behind the wheel, you increase your risk of being in an accident. Decatur drivers have lower commute times than most of this nation’s drivers, and this helps keep local car insurance rates affordable. Being a victim of auto theft can be devastating. Fortunately, having comprehensive coverage included in your car insurance policy can help. Rates for this coverage are oftentimes dependent on the local crime level, and Decatur has a very low auto theft rate. That means you could score some major savings on your car insurance.